Thailand is not a super windy place. You wont see the amazing freestyle moves of Bonaire or the Gorge, nor will you see hot wave sailing action. With average wind strengths of 8- 18knots Windsurfers here are mainly using sails from 6.0M to 8.5M. In the worlds top locations a 6.0M sail is considered large. So why do core windsurfers from all over the world choose to settle in Thailand. Thailand's perpetually warm water and even warmer people. Low cost of living and very comfortable healthy lifestyle make the choice of leaving their homes utterly bearable. Many classic Mediterranean retirement destinations are more expensive after the Euro's introduction. Thailand, with it's Idealic Beachside lifestyle is becoming a popular place to make those pension Pounds, early retirement Euros', and dwindling Dollars go further. As soon as the wind is good, they are on the water in minutes on the latest windsurfing gear, some of which is designed especially for the lighter wind conditions. On good days when the wind is over 15 knots , there are over 20 sails on the water in the best spots. While this number is tiny compared to the world's classic destinations where windsurfers number in the hundreds. It is double what you may have seen 3 years ago in Thailand. Thai people are enjoying the sport in larger numbers also. A club in "Tabsai" near to Bang San University is hugely popular among Thai's who have regular camp outs and parties there on weekends. 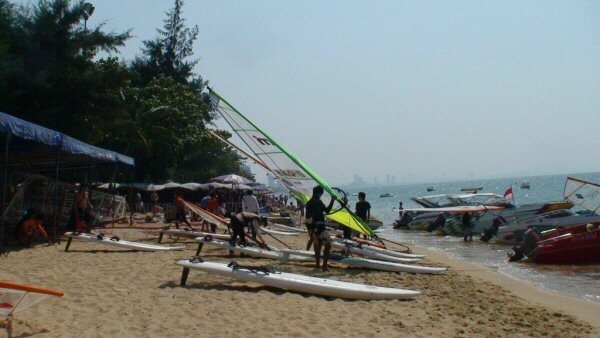 On Jomtien Beach in Pattaya, The government and City sponsored Windsurfing Association of Thailand has been revived by a team of ex Thai windsurfing champions, coaches and local politician's. The benefit of this work has gone straight into the local community where kids, are training and competing in local and overseas competitions. It is heart warming to meet these youngsters who are polite, happy, self-reliant and who will grow up with a close connection to sport and the environment. Everyone is welcome to join the local windsurfing races. With up to 70 entries and many international guests, Thailand is producing high-level athletes, often from poor or broken families. Pattaya City, about 2.5 hours drive SE from Bangkok, is brimming with international restaurants, world-class hotels, inexpensive shopping and is still one of the greatest places to learn Windsurfing. About 10 km south of Pattaya you will find 2 of the largest Water sports clubs in Thailand. This area is where the locals, expats,(foreigner's living in Thailand) and tourists come to take windsurfing lessons, play and relax. Windsurfing in Thailand is just another reason why people consider working or retiring early in one of the worlds most famous travel destinations. Craig Thompson, born in England, raised in Australia, married to Thai National Windsurfing Champion, Amara, has been living and breathing water-sports in Thailand since late 2003.